Have you heard of the newest snack craze called "walking tacos?" This food trend originally started with taco ingredients, thus why they are called walking tacos! People were mixing and then eating their favorite taco condiments in a bag of chips--like ground beef, lettuce, cheese, sour cream, salsa, etc! This food trend is the solution to taking messy foods on-the-go! Today, I'm sharing my sweet tooth spin on the walking taco craze, and I'm combining my favorite spooky snacks right inside the Go-Paks! My Spooky Walking Taco Party was a hit! We had a small get-together with some friends over the weekend, and we hosted a spooky walking taco party! 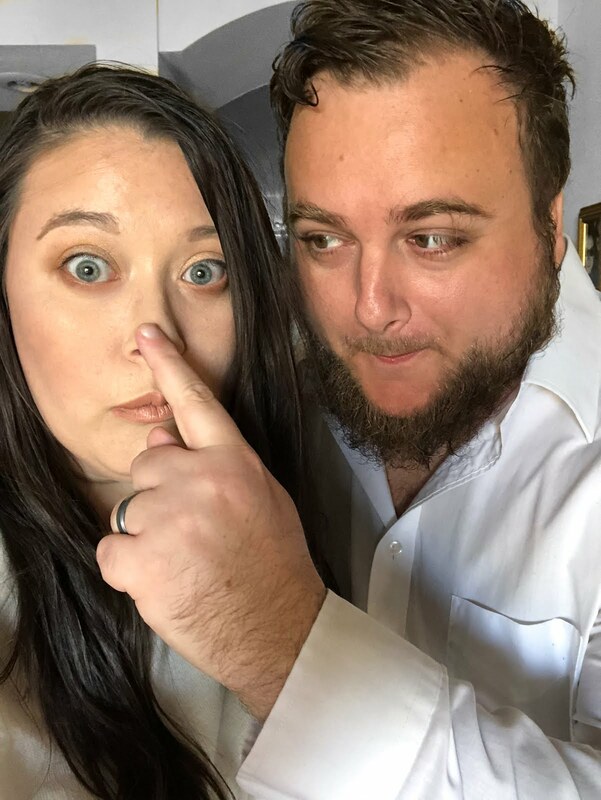 Walking taco parties are fun because it lets your guests create their own snacks, and you don't have a huge mess and lots of dishes to clean up after the party is over! Today, I'm sharing all of the details for how I put the party together, along with some recipes and DIY tutorials! 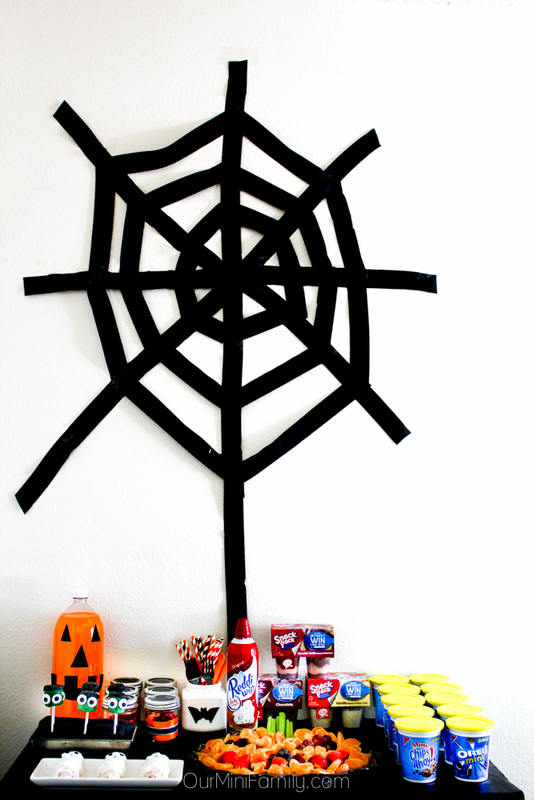 Before I started setting up for my party, I decorated the wall with some black streamer in the shape of a simple spiderweb! It took about 20 minutes to put the entire decoration up--I started by making an asterisk shape on the wall; from there, I went and added layers of webbing from the outer layer and working my way inwards towards the center. This easy wall decor project cost me a whopping $1 to make--all I had to buy was black streamer (and I did not even use an entire roll!) The only other supplies I used were scissors and clear masking tape--to cut the streamer and then temporarily adhere it to the wall. Since we knew we wanted to host a Spooky Walking Taco Party, I knew I wanted to come up with some fun Halloween-themed snacks that would mix well in our sweet snack walking tacos! 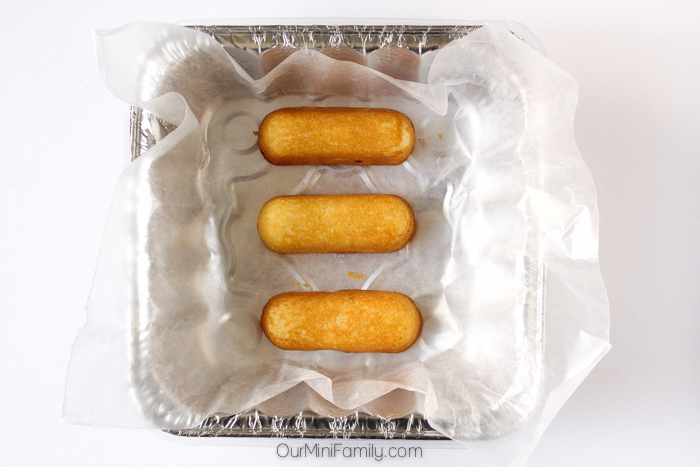 Take the sponge cake out of its wrapper and place it on a non-stick surface. I would recommend sticking it inside something with edges (like a pan or bowl), since the icing that you will use will run. Heat up your cookie icing so that it's very warm and malleable, and then pour it over the sponge cake. Let the icing cool on top of the sponge cake for 15-30 minutes. You can speed up this process by placing the cake in the refrigerator. 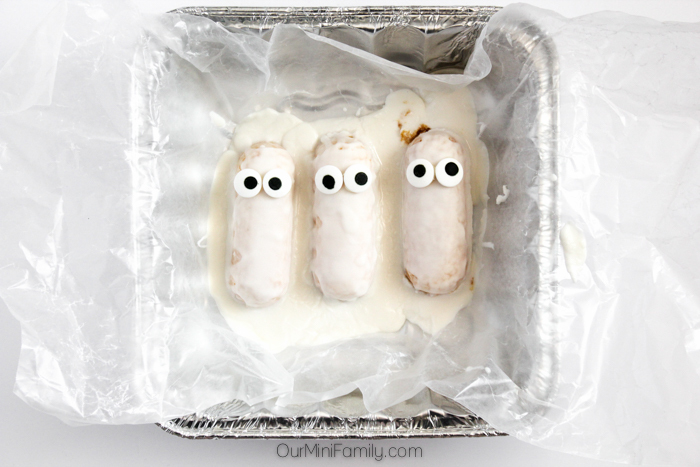 Once the icing has cooled and solidified on top of the sponge cake, place the candy eyeballs onto the mummy; adhere the eyeballs to the cake and icing by placing a small amount of frosting on the back of the eye and stick it to the cake (the frosting works like an edible glue). Drizzle the room-temperature vanilla frosting on top of the cake, and be careful to avoid getting any on the eyes. Using a backwards and forwards motion when laying the frosting down to create the mummy bandages look. 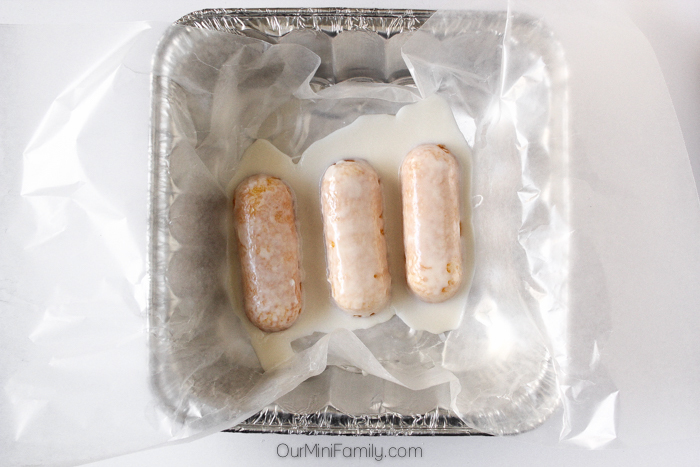 Serve or store in the fridge for later! 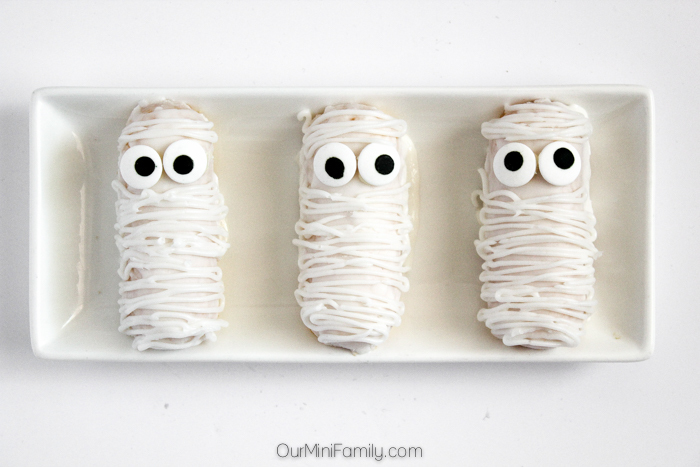 These mummies were so fun and very easy to make! This would be a great way to get the kids involved with party prep! 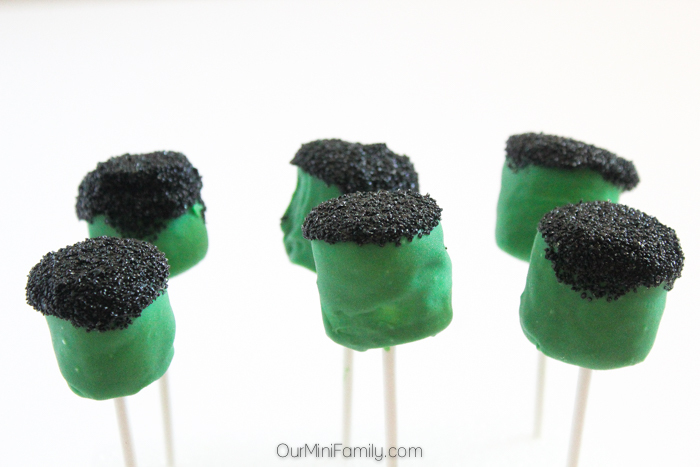 Another spooky snack idea that is fun to make with the kids is our Marshmallow Monsters! Heat your chocolate melts in the microwave in a microwave-safe bowl. Stir the chocolate until it's smooth. 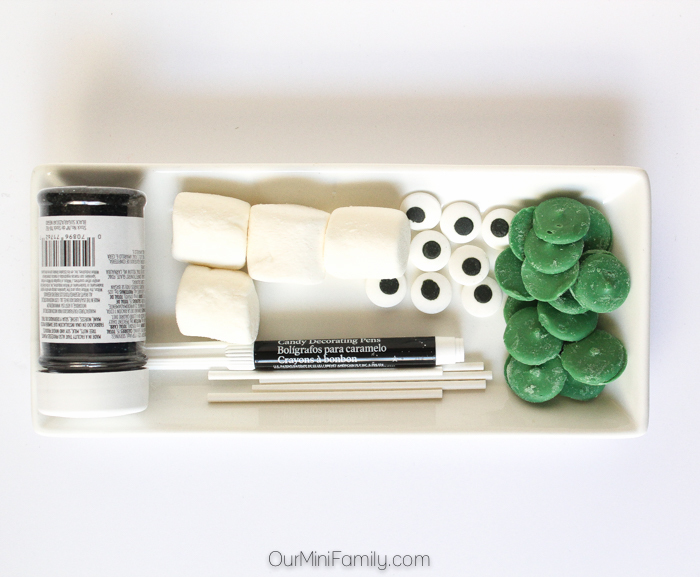 Dip your marshmallow in the green chocolate melt until the marshmallow is completely covered. Remove the marshmallow from the bowl by sticking the lollipop stick into it, and then tap off the excess chocolate. 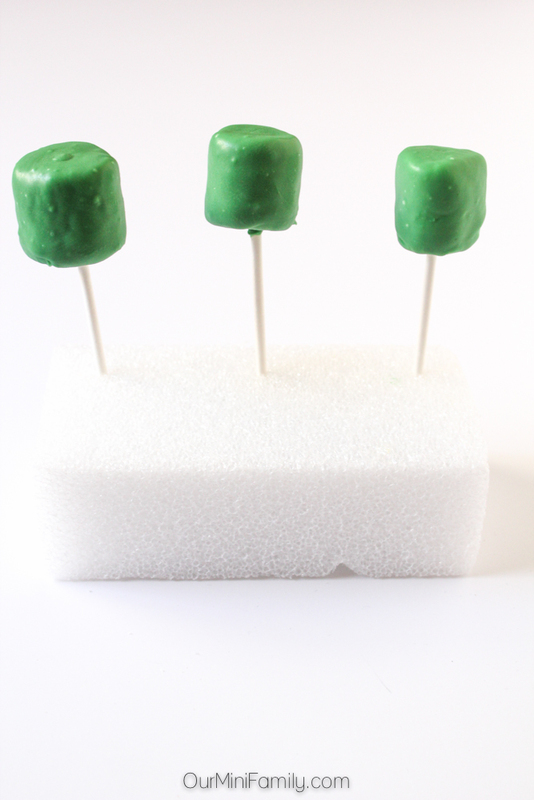 Stick your candy-dipped marshmallow into your styrofoam block and allow the candy to harden. You can speed up this process by placing the marshmallow in the freezer for a few minutes. Once the chocolate melt has hardened around the marshmallow, re-heat a small amount of your chocolate melts and dip just the top of your marshmallow back into the candy melt--this will serve as the glue to attach the black sprinkles (or monster hair) to your monster marshmallow. Gently dip your marshmallow top into the black sprinkles. Place the marshmallow back into the styrofoam block and allow the candy to harden again. 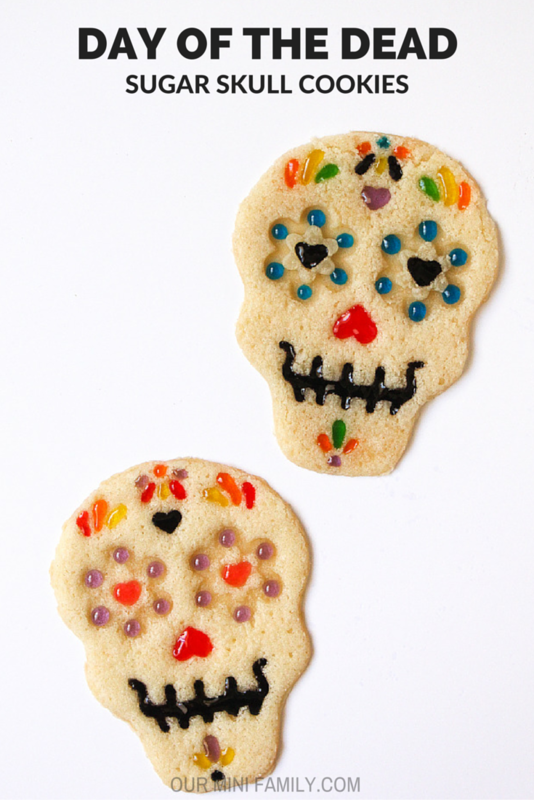 Use your edible marker to draw your monster's face. Some ideas to consider: I like to have my monsters all look different! On some, I drew a small smile at the bottom of the marshmallow, and then on others I also drew a horizontal line across the top of the monster's forehead. 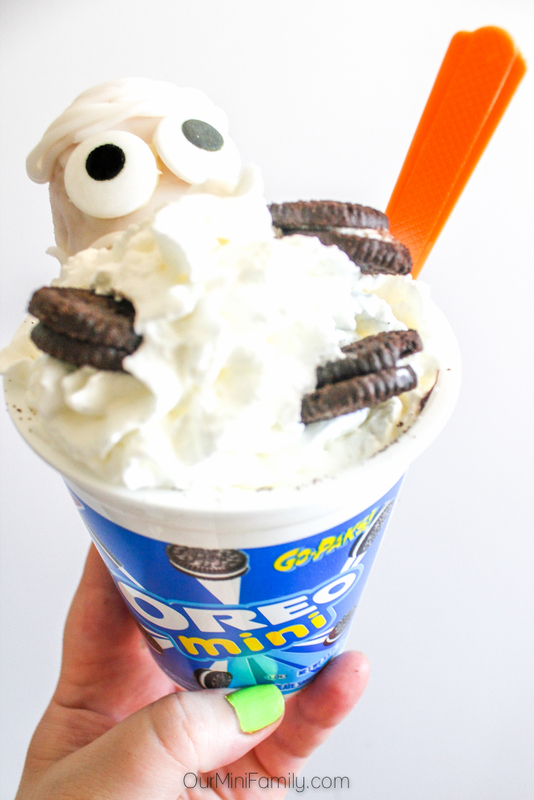 Have fun with it and draw different types of features on the marshmallow monster's face! 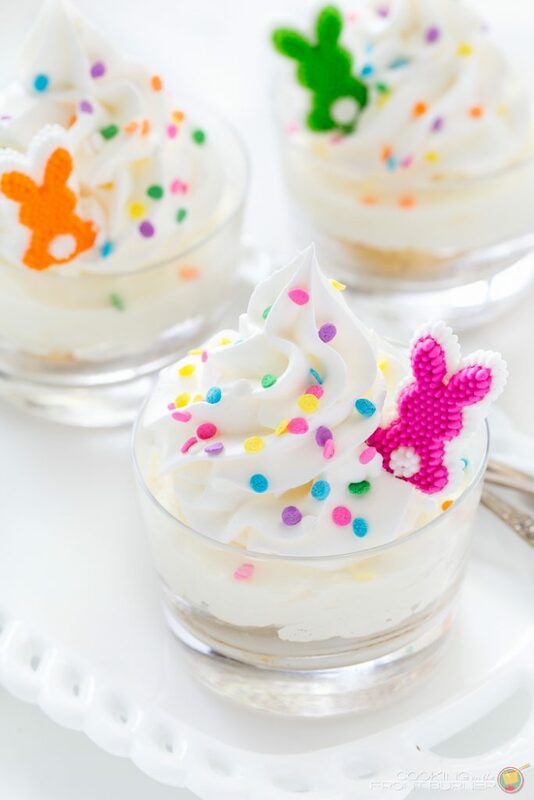 These Marshmallow Monsters are vibrant and fun to customize! 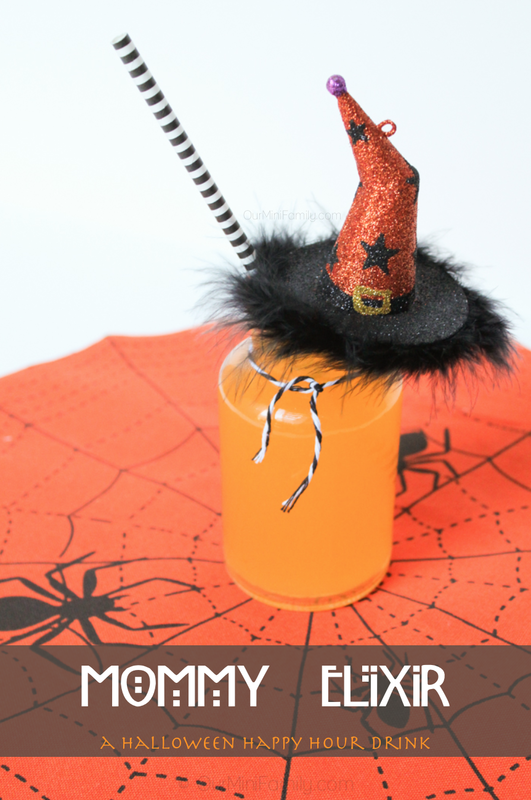 They are also another great project to get the kids involved with when planning and preparing for your Halloween party! 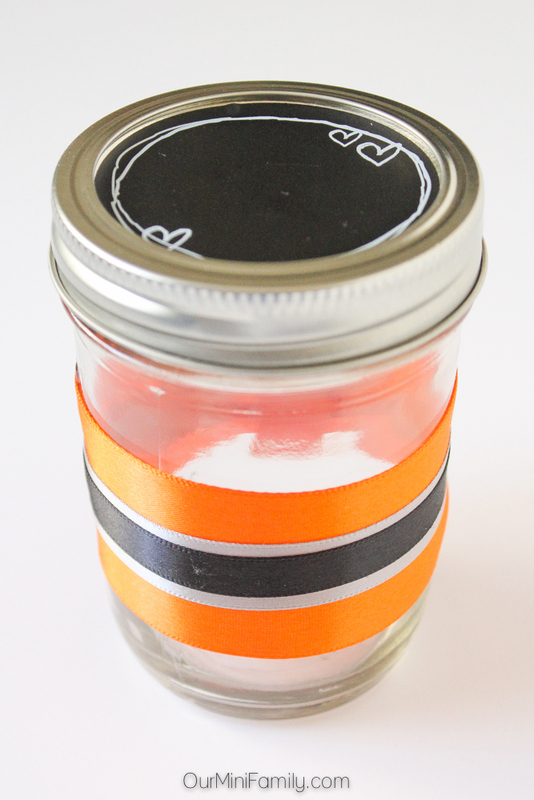 For our Halloween mason jar cups, I used: standard-sized mason jars with lids, round chalkboard stickers, scissors, a hot glue gun, large orange ribbon, medium silver ribbon, and small black ribbon. 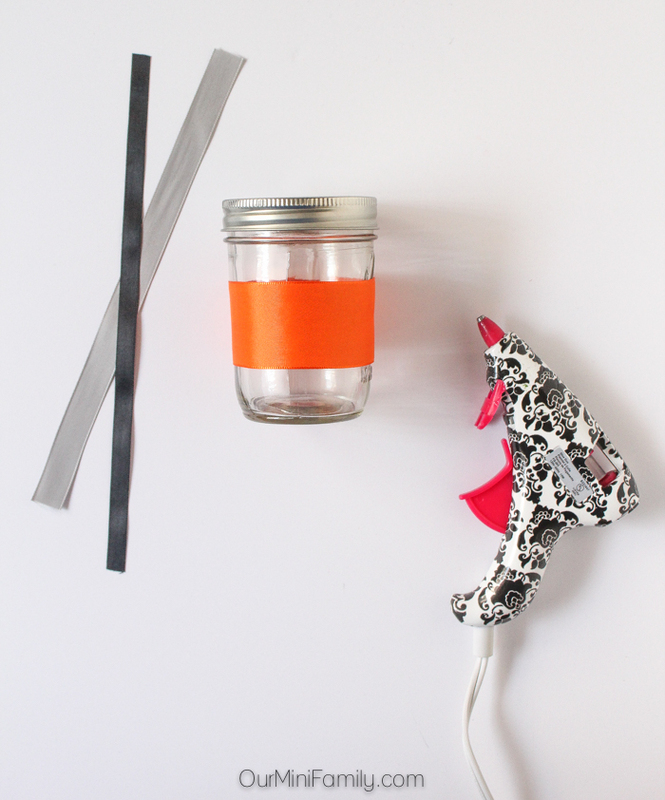 I started by cutting the ribbon down to wrap around the mason jar, and then cut the ribbon to fit. 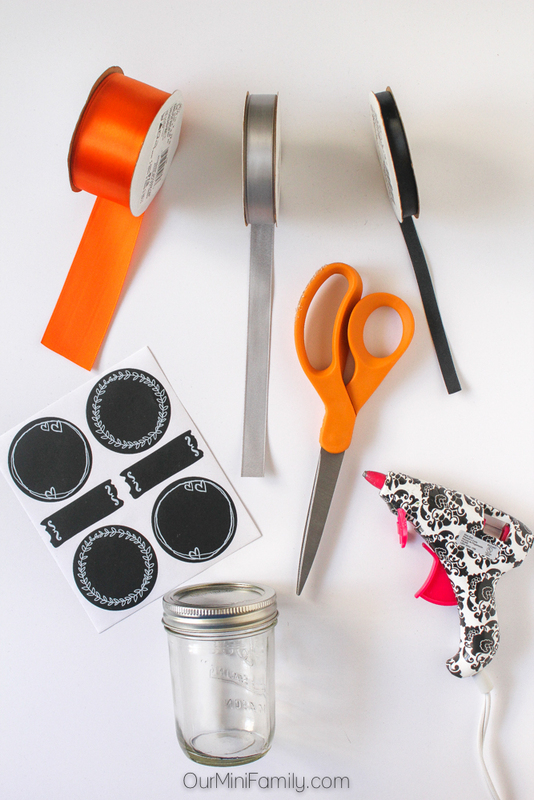 I attached each layer of ribbon on top of the mason jar individually with the hot glue gun--I started with the largest ribbon, and then worked my way up to the smallest ribbon. 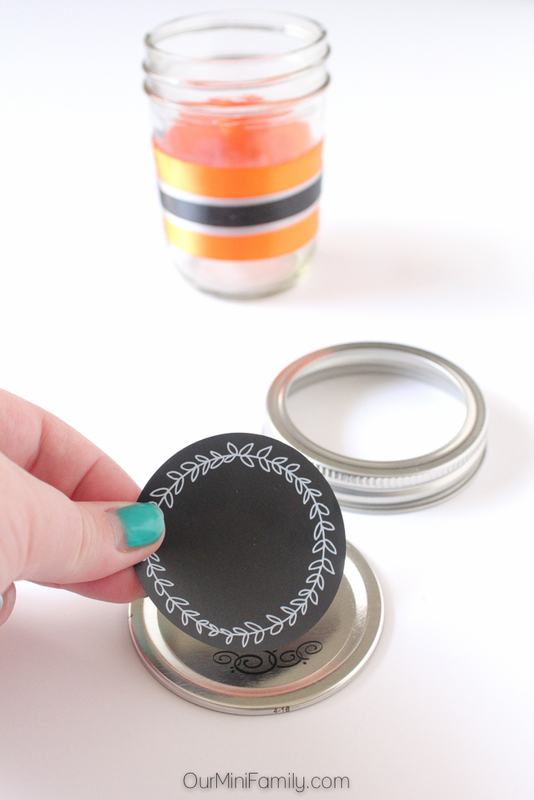 I attached the round chalkboard stickers to the tops of the mason jar lids--this is a great solution to keeping track of everyone's drink. I left a small piece of chalk on the table so that everyone could write their initials on top, and everyone just used the same cup all night. The orange soda, jack-o-lantern face was super easy to make! I used a small amount of black felt, scissors, and glue to put it together. 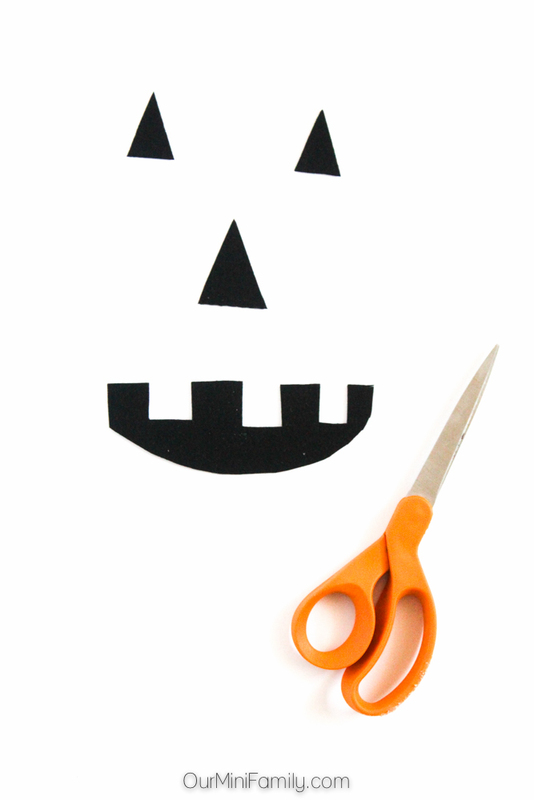 First, I cut out the jack-o-lantern face (i.e. jagged teeth, one large triange for the nose, and two small triangles for the eyes). Then I glued the black felt face onto the orange soda bottle. That's it-- it was a super easy way to bring a Halloween element to the party drinks! 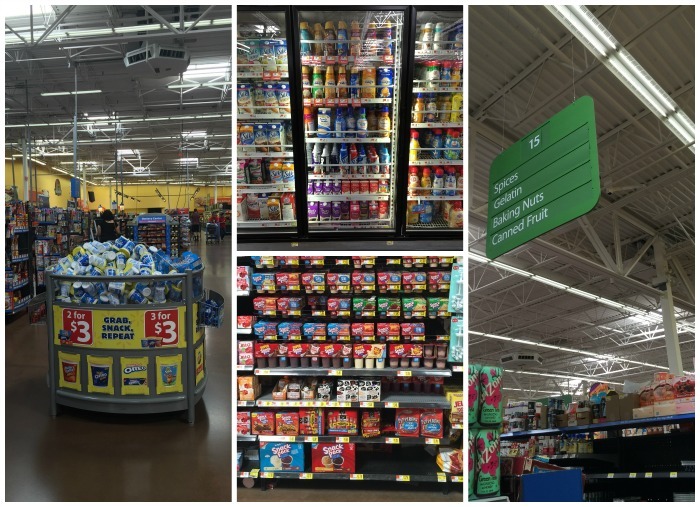 I love stocking up on Go-Paks because they are only $1 each at Walmart, and everyone can easily create their own little walking taco right inside the Go-Paks! Go-Paks pair perfectly with Snack Pack® Puddings and Reddi-Wip, and they are very affordable just like the Go-Paks. These products were perfect for my spooky, walking taco party--stocking up on these made serving multiple people super easy! And here is the star of our spooky walking taco party--the Halloween, Jack-O-Lantern Fruit Platter! Everyone went crazy for this festive fruit plate! Peel and divide 2 dozen clementines. Prepare the remainder of your fruits and vegetables by washing, cutting, etc. 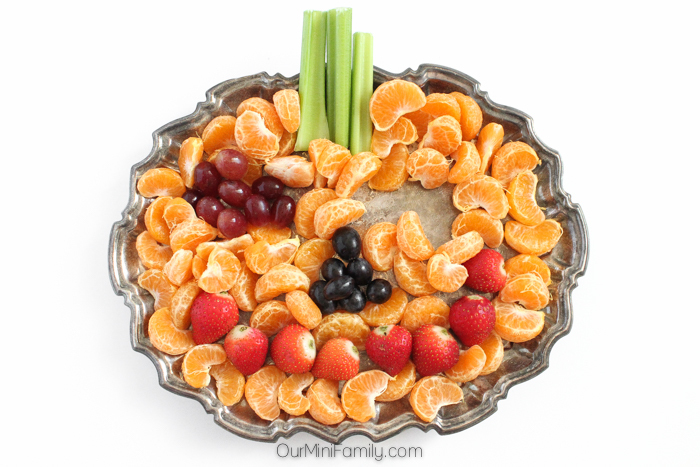 Use a large, oval-shaped platter or bowl to help you naturally create your jack-o-lantern shape. Line the outer edge of your platter with clementines and place your celery at the top and middle part (the celery emulates the look of the pumpkin stock). Line your strawberries along the bottom and create a small semi-circle shape. This will be the jack-o-lantern's smile. Arrange the blue grapes in a small triangle in the middle part of the platter, so you can create the look of the jack-o-lantern nose. Place clementines around the nose and use them to help hold the grapes in place. 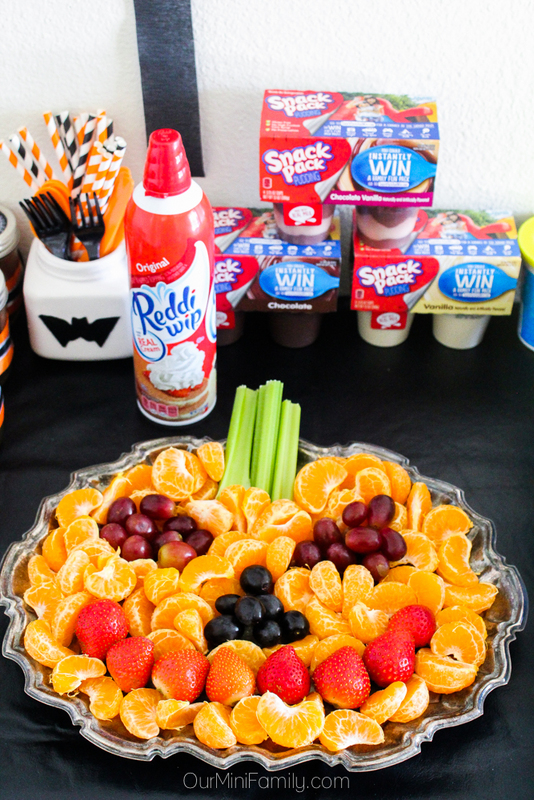 Repeat the same process with the red grapes, except make two piles of grapes on both the left and right sides of the platter (this will create the look of the jack-o-lantern eyes). 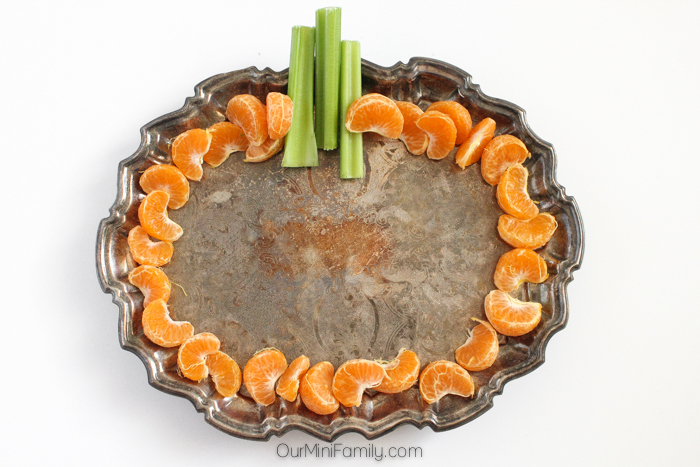 Fill in the remainder of the clementines to both help hold the other fruit in place, as well as make the platter look fuller. Serve chilled and with your favorite fruit and veggie dips! 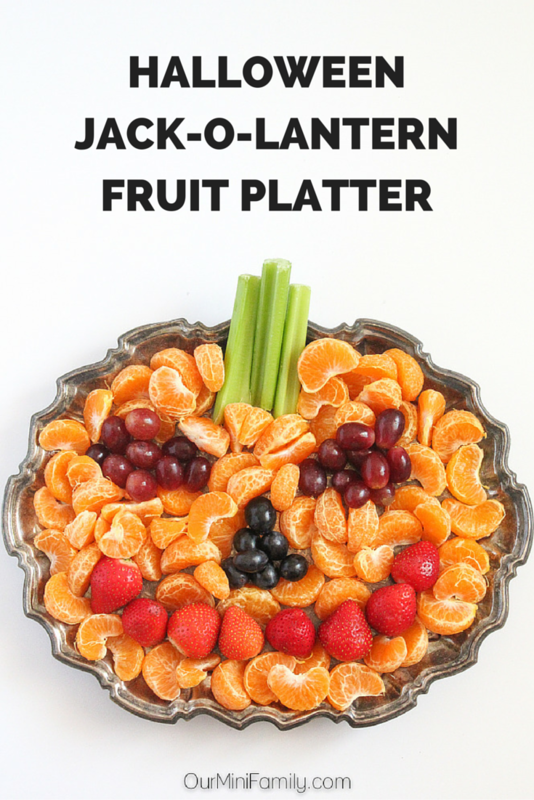 Impress your guests at your Halloween get-together with this Jack-O-Lantern Fruit Platter! 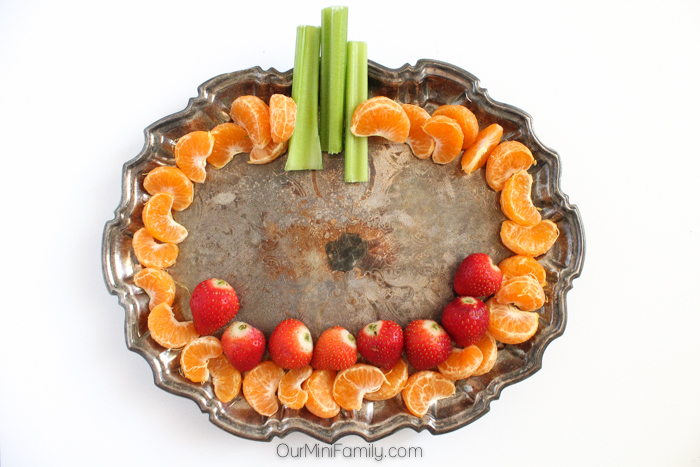 It's a beautiful, festive way to incorporate fruits and veggies into your party plan! Fill your Go-Paks! with one half of a container of vanilla Snack Pack® Pudding. Mix the cookies and vanilla together with a spoon. 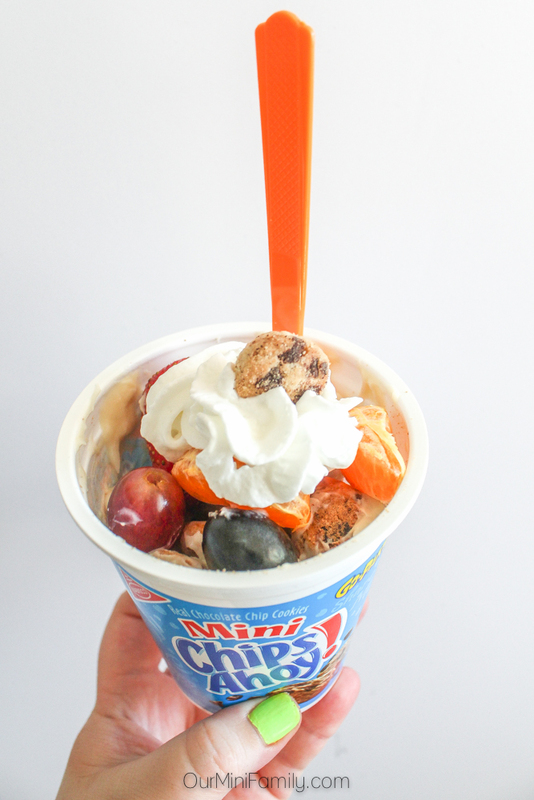 Add in one scoop of pumpkin ice cream, and then add in your Reddi-wip on top! Place a few extra cookies on top and enjoy! The sweet tooth walking taco combinations are endless! 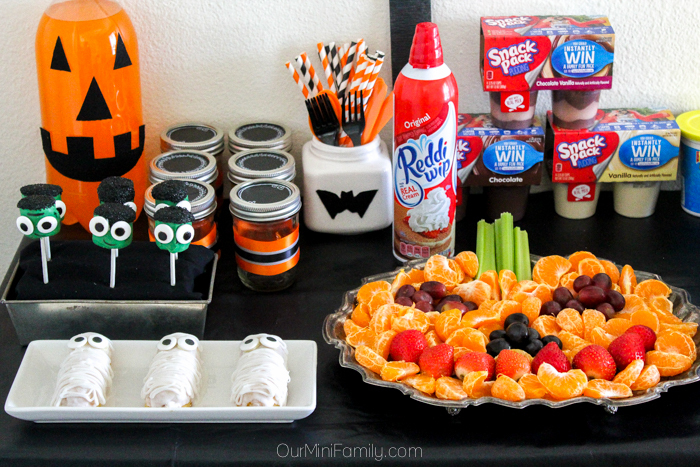 Some of my other favorite walking taco ideas from our party included mixing fruit, as well as mixing in our spooky marshmallow monsters and mummy sponge cakes! These sweet walking tacos go perfectly with Go-Paks! The cups are plastic and won't leak, and the cups are only about half full of product (so it's easy to add ingredients to the container!) Be sure to check out more delicious #SnackAndGo ideas for your walking tacos! Grab this exclusive coupon for your next purchase! 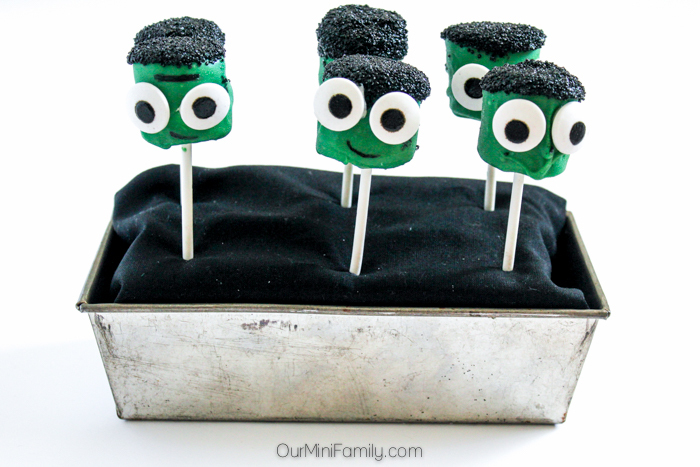 Those little Frankenstein marshmallows are so cute! Thanks Lydia! The mummies are Adam's favorite, too! What a fun party. I love the fruit jack-o-lantern. This looks like so much fun, Cathy! (And YUM!!) I love the mummies--and the spiderweb. What a great idea! OMG the fruit platter is awesome! I had never heard the term "walking taco" before reading your post, so thanks for the lesson! Looks super yummy. I just recently heard of walking tacos, and I am glad you liked reading about it!! What a cute party! I love all the details! 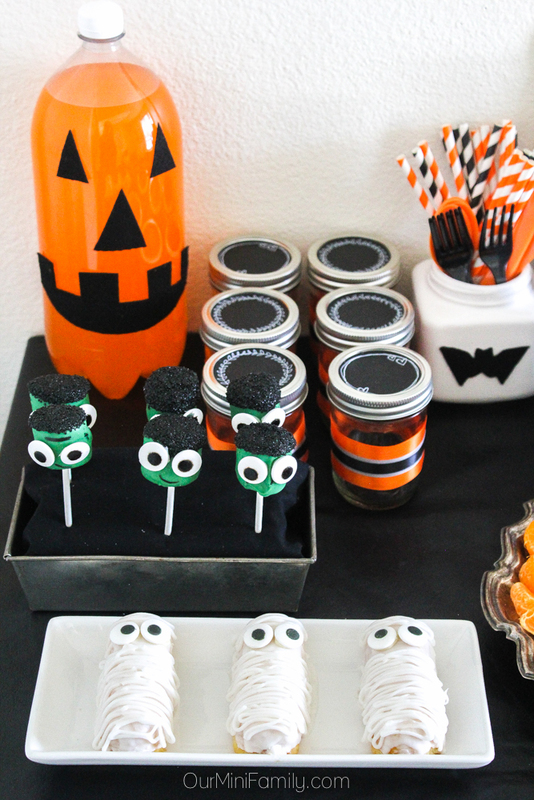 Such fun party ideas! You made it so festive!!! Thanks so much, Barb! Glad you like it!! These are all such great ideas! I love hosting Halloween parties, but the last few years we haven't been able to. Maybe you'll give me the motivation to do it again! I hope you do, because your blog recipes are fantastic! I know your food would taste amazing! What amazing and fun ideas! I love the pumpkin. Such a fun party for the family. I need to keep these ideas for my family party coming up. I hope you do incorporate an idea, and if you do I'd love to see your photos!! I love the pumpkin fruit and veggie tray! Definitely bringing that to my Halloween party. What cute ideas. Thanks for tweeting and pinning!! I LURVE the fruit platter, what a lovely idea.